Gold, Silver or Bronze: when it’s red, white & blue you’re always a winner. 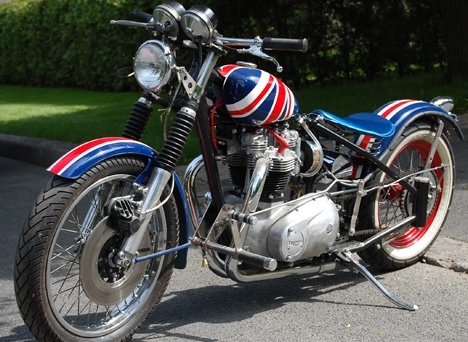 In celebration of the 2012 London Olympics here’s a Union Flag endowed Triumph Bobber finished to turn heads wherever it goes! Crossing Chelsea Bridge then Ratting off along The Embankment. Noggins need lookin’ after so what better that a nice bin-lid from those folks at Bell. Oh, and remember to take care of your better half’s tete too! 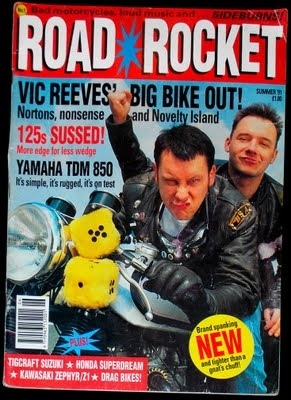 I do sincerely believe I have gotten on top of all of the issues with the wee bike! 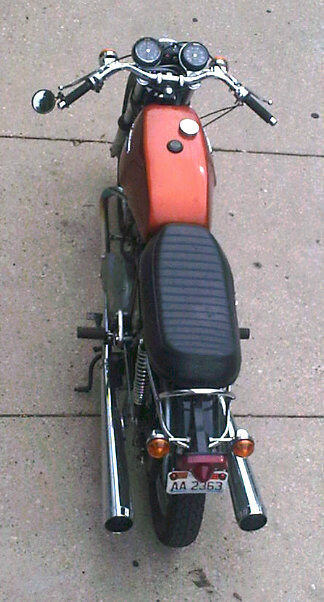 A kill switch added, tickled carbs and swift kick… Into life before the kick lever was back to its top. Now just need a long, windy, quiet road and some time. Hopefully next weekend. Glass plate memories of ‘Way out West’ motos of days gone by when Sitting Bull would have ridden a Triumph rather that some tamed pied mustang. Edward Curtis get yer Brownie out! He wouldn’t let it lie! Jim Moir, also known as the other half of Reeves and Mortimer, Vic Reeves enjoys giving his slicked back look a reason to adorn his bonce. He owns and rides a Royal Enfield Bullet. 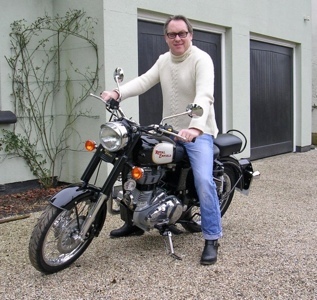 That submariner sweater is a perfect British undergarment for the typical damp conditions. 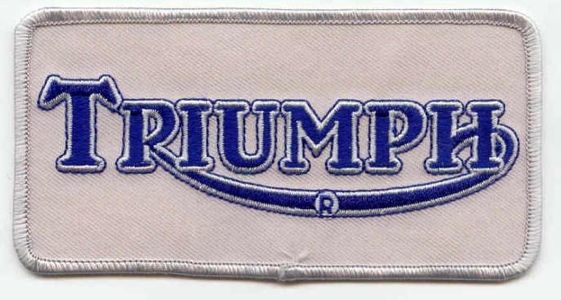 Either a hole in your prized jacket needs patched or you wish to celebrate your favourite makers logo. 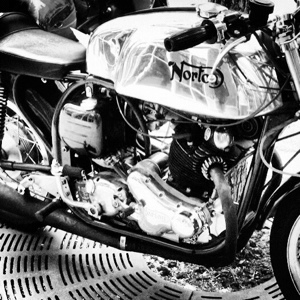 Mercury-like globule of a tank moves under the power of a tremendous Norton Commando twin; whose slanted barrels atop that distinctive amoeba shaped timing cover sprint this cafe racer to great speeds. A Slimline frame holds these ponies in check allowing the rider to put them down to pavement in fine style! Alloy rims with modern tyres and newer disc brakes give two-wheeled confidence. A mint coloured late sixties Bonnie sliced into strips of envy like some zoetrope barrel flicker show. 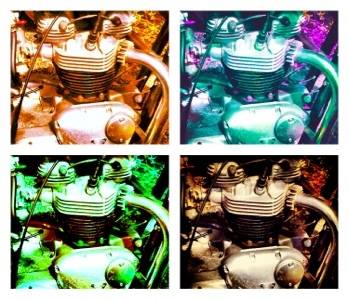 Andy Warhols screen printed bike… His Pop Art period spanned the golden age of the Triumph Twin. Art meets Art. Time please gentlemen, time please! 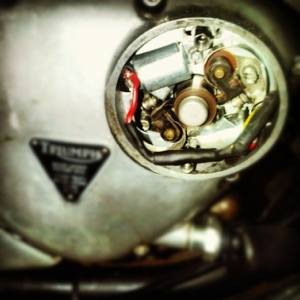 Motorcycle maintenance was on the cards for this morning… Taking out the Boyer electronic ignition and putting the points back in. The garage was hot and humid and after four hours of sweating, kicking, cursing and nearly calling it quits at least three times, it roared to life. Set the timing advance and it settled into a old fashioned twin grumble. first all, before setting timing, set gap on each point where the little scribe on the cam is pointed to the points nylon lobe, and set the gap at this position only. This should be just after they start to open. (.015″). Now, just take the cover off the rotor (front left case with 3 screws and TRIUMPH logo) and line up the scribe line to the pointer by turning the motor over slowly. This is 38 BTDC. At this point, turn the cam lobe on the point shaft as far to the right as it will go (centrifugal advance unit). Adjust the point plate to the spot just where one of the points breaks contact. Tighten the point plate. Spin the engine 1 full revolution so the pointer and scribe is lined up again, and turn the cam as before (this time it will be 180 out and pointing to the other point. Loosen the top and bottom of this point set and there is the eccentric screw to raise or lower the point assembly to set the point to it just breaks. Lock the screws down. Now start the bike with the rotor cover still off, and check the timing with a light. Rev up until the scribe meets the pointer and doesn’t advance any further and confirm with the static settings you just performed. If it is too far, you will need to adjust accordingly with the eccentric adjustment. 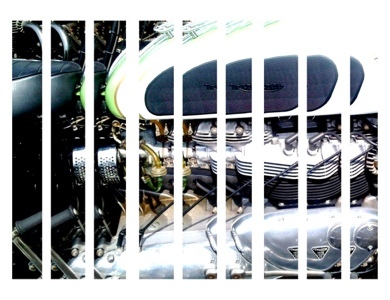 Do this with both spark plugs as each cylinder is independent to each point and coil. Yellow/black wire is for left cylinder, white/black wire is for the right. Pedal, pedal, pedal… Wheels go round. 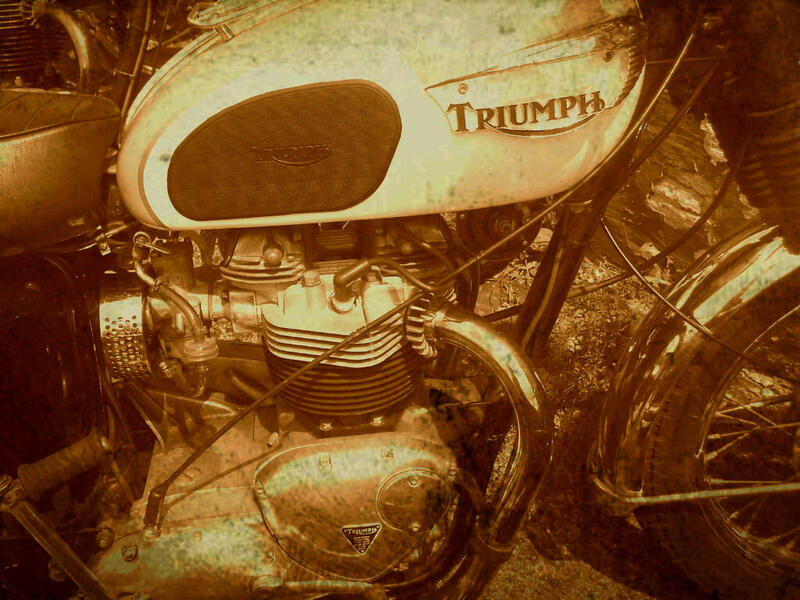 Most of the older motorcycle manufacturers started out as bicycle makers, such as BSA, Raleigh and of course Triumph. 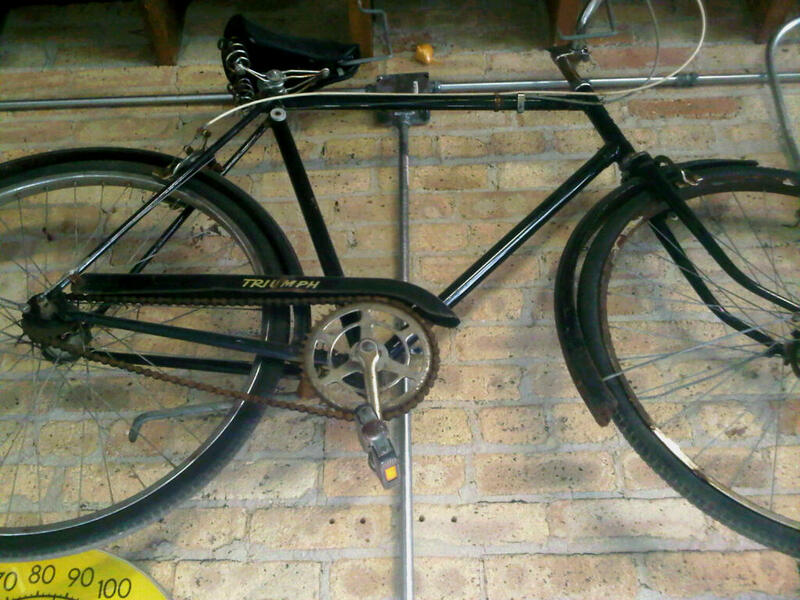 The cycling arm went off as a different branch but the two-wheeled family tree has common roots. These mid-century ‘safety frame’ bikes are worthy of hanging on the wall with their balanced mechanical perfection. 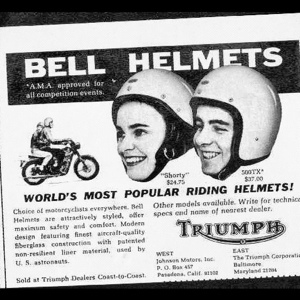 Open-face lids, goggles, silk scarves, leathers and big boots. All mean grimaced and ready to roll. 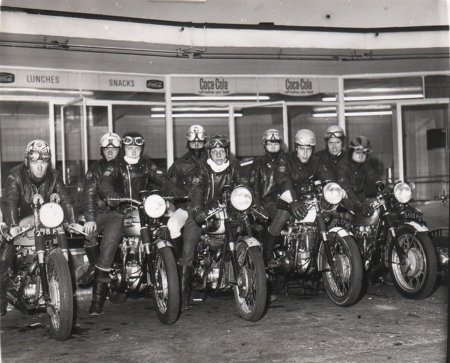 Bikes are Norton, BSA and Triumph are the ride to rumble on of course. I’m sure when this quintet crack open their throttle mechanical music ensues. This image was meant to go online yesterday but it leapt right over the 18th. So we see it here today. 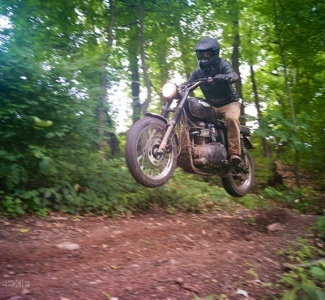 A modern-day Tri-scramb goes airborne. Hope the rider gets down in one piece! 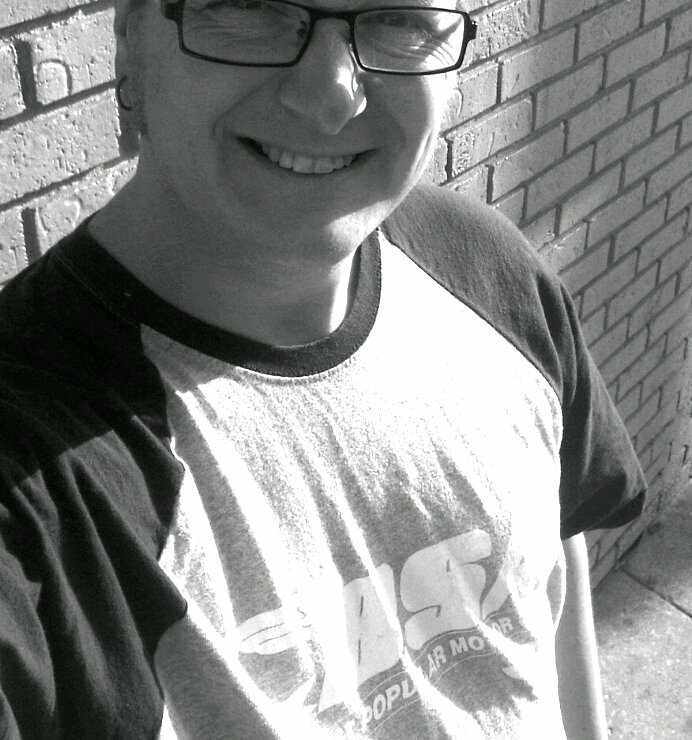 Hot weather here in Chi-Town (98 degrees plus) calls for a plentiful supply of t-shirts; my newer BSA is a current fave. 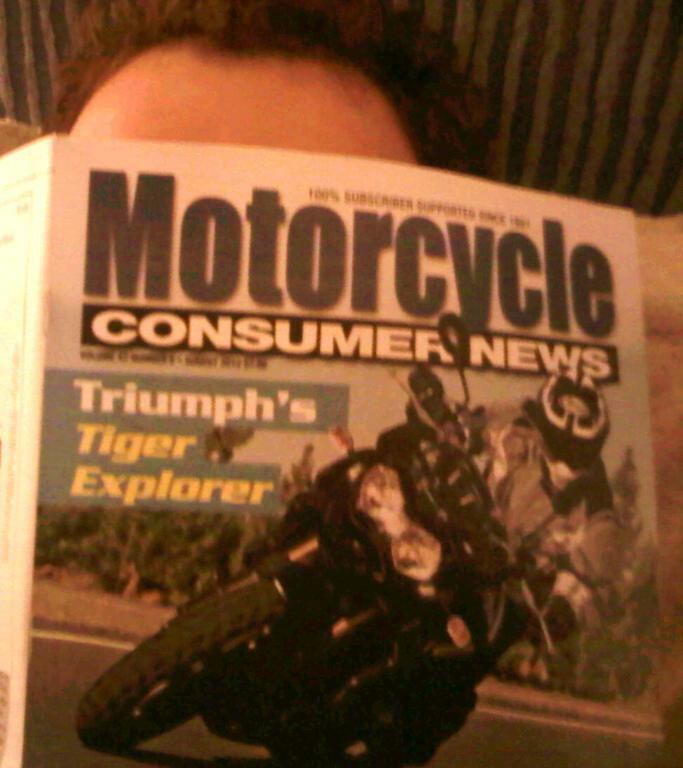 The latest Motorcycle Consumer News arrived in the mail today; and even though it had a appetite sating article on the globetravelling busting Triumph Explorer I stll dozed off mid-article. Retracing Jupiters Travels on this one would be an Adventure, that’s for sure. Ted Simon, where are you?